This has provided me with an opportunity to rework the estate. My profile says I have now been here for 1496 days (over 4 yrs). So its about time. 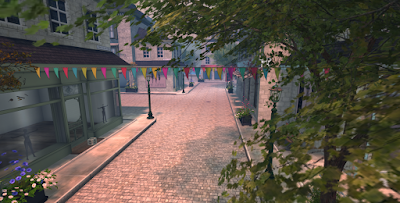 Inworldz for me has just really evolved from an idea, into an Estate of over 30 sims. Each is themed around the English Countryside, my home. Its a photographers dream who knows whats round the next corner. You are welcome to sail, fly, ride or walk and take your time dont miss anything. Our new Estate office is stunning another winner from Veronika Garzo. I really do love this place. Why dont you take a trip over to Inworldz take a look around at how far we have come. I am sure you, like I will love it and choose to make it your home. Ok so its been a while, frantic busy in all worlds. In Virtual Worlds folks come and go. I guess its like that in real life also. It seems to be the *want it now generation* Longevity would appear to be a thing of the past. I am glad to say I am a *stayer* ( some would say for too long sometimes) I hate quitting with a job half done so lets dig our heels in and get it done. "The creation of The Lanes sim has been somewhat organic and evolutionary in nature. It was effectively, borne of free flowing ideas from both Cherry Charlesworth and myself and it grew, piece by piece, section by section into what I hope is a natural and flowing layout, reminiscent of real streets, in a real town. The textures of sandstone, brick and cobble tones have been created specifically and uniquely for this build. They are tonal and soft, designed to compliment each other and to run seamlessly from building to building. without stark contrast"
We also have our own website for it which sets it apart from your usual stuff. More details on this later. My heartfelt thanks to Nika for persevering and finding a way to translate what is in my head into these stunning unique places.